Narration tells a story or conveys a message verbally and helps clarify complex information. It is important to remember that a well-written script, smooth delivery and clear, crisp recording can make a world of difference to your explainer video, commercial or product demonstration. It is import to note that even though you have prepared for everything, sometimes things don’t always go to plan, that’s when editing can be helpful; we use a music stand to hold the script for the narrator because the microphone would pick up the sound of the page being held, or the sound of pages been turned. Headphones for both you and the narrator will also be helpful. We place a pop-filter in front of the mic to cut out some of the popping sounds that occur naturally when we speak (for example P’s and S’s). Before we start recording our narration, we record the room and listened for ambient noises. Getting the vocal level right is very important also, too loud and the voice will distort, too low and you won’t be able to hear it. Slow down the speed of narration being read, read too fast and it will sound rushed. 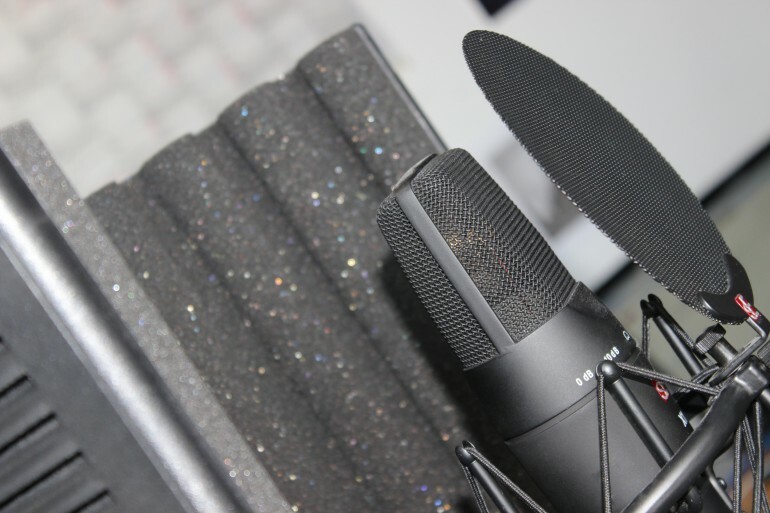 Get close to the mic (1 to 4 inches from the microphone should be sufficient for recording the narrator’s voice). Using hand gestures between you and the narrator can be a great way to communicate. Just counting three, two and giving the thumbs up to cue recording on one is a great example of this. We record numerous takes so that we could edit all of the best takes later on. This is where the fun begins! We used Adobe’s Audition to edit our narration. We used the FFT Filter to remove the areas with noticeable popping of P’s and the sibilance of S’s; with a few clicks of the mouse the problem was resolved. We also used Audition’s Compression Filter to amplify quieter sounds, whilst reducing louder sounds for a smoother, more even result. There are a lot of great tools at your disposal that can give your narration that professional feel and quality. At Glue we discuss the script in depth for the narrated storyboards, otherwise known as an animatic, with our customers ensuring the message they want to convey is crystal clear. The visuals along with the narration for your video must be woven into a seamless video that you can be proud of and most importantly your new customers see the value of your product or service.